Don't miss you chance to bid on this beautiful necklas created by Jan Davenport of Saddlebred Fancies. Many Morgan fanciers love it too! The horsehead is hand carved sawo wood. 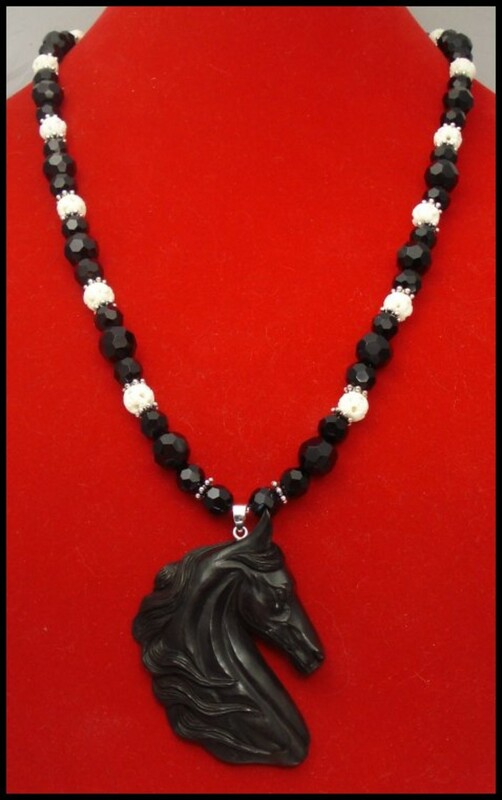 The black beads are multi-faceted glass with hand carved bone beads. Most of Jan's items are one or two of a kind. The wire connecting the beads to the necklace is all hand wrapped and attached with split rings. Jan Davenport is a wife, a mom of 1, grandmother of 2, chauffer, chief cook and bottle washer, horse lover (Saddlebreds in particular), artist, jewelry designer, and all around bizigal! She’s very thorough in all that she does, and last but not least, she’s a woman who loves pretty jewelry, and enjoys making it so much that she’s often up until the wee hours of the morning making certain that every bead, every charm, and every spacer is placed exactly where it belongs. Much thought and planning goes into each of these hand made creations because it’s Jan’s nature to see to every detail – and if it’s not exactly as it should be, she’s been known to disassemble the whole design and re-work it! reproduce some of my original art work from tote bags that I had painted in the past. I also use the wonderful artwork of Jeanne Schoborg. charms are non-tarnishing and sealed with a professional waterproof glass-like resin. As time and enthusiasm progressed, Saddlebred Fancies was created. I would like to thank my customers of the past year and my friends for all the encouragement and support they have given me.